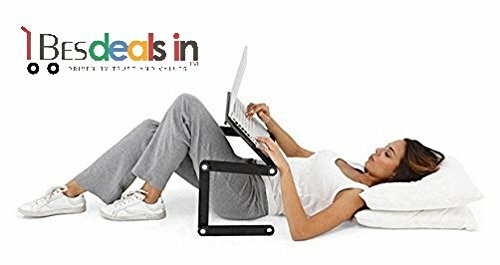 BEST DEALS - T8 Adjusting Laptop Foldable Desk Notebook Table Folding Drawin Board W/ Cooling Fan - Aluminum Alloy - Black@1495 Rs [Mrp:-1495] - Onlinedeals.discount - A leading product discovery website. Find the true prices of products, read reviews and buy top brand products at reasonable prices. Foldable laptop table with fans and mouse table. Multifunctional applications, can not only be used as a cooler, but also as a laptop / reading table in family and school, in an office and a car and for travel purposes. Enjoy the fun of the Internet in bed, sofa, table, carpet, lawn. You can use as laptop desk, writing desk, Sketchpad, dining table, Flower Stand, etc.